Find the suitable exam resource and go through the requirements to proceed further. Revise using our resources developed by clinical tutors, staff that makes easier to clear exam. Use the performance report and daily logs to understand your strengths and weaknesses. How can our revision platform help you? Our regular assignments help you to focus your revision and improve your knowledge. We will help you to structure and plan how to systematically tackle all the relevant topics and make handy revision notes as you progress through the training. Detailed Performance report will ensure you understand how you are performing by session and improving overtime. Your daily log tracks all the activities throughout your training program. Our MCQ's and suggested study material makes you to revise offline aswell online, allowing you to fit in your revision wherever you are around your work and home commitments. We provide 24/7 support through online chat services and VoIP services that gives you continues support throughout the process. The ORE is an exam that overseas qualified dentists must pass in order to register with the GDC. Registration allows dentists to practice dentistry unsupervised in the UK. The ORE tests the clinical skills and knowledge of dentists from outside the European Economic Area whose qualifications are not eligible for full registration with the GDC here in the UK. Candidates are expected to meet or exceed the standard of a ‘just passed’ UK BDS graduate. The exam is based on the UK dental curriculum and uses modern assessment methods to ensure a robust and consistent exam. Each paper lasts 3 hours and is made up of Multiple Short Answer questions (Extended Matching Questions and Single Best Answer Questions). An operative test on a dental manikin - Candidates are required to perform three procedures over a period of three hours. These procedures primarily involve the preparation and restoration of teeth, but may also include other procedures where appropriate simulation can allow assessment of operative skills. An Objective Structured Clinical Examination (OSCE) - This is where candidates visit a series of ‘stations’ which test their clinical skills. These may include history-taking and assessment, communication skills (such as an explanation of problems and treatment plans), judgement and decision making, ethics and attitudes, and clinical examination. 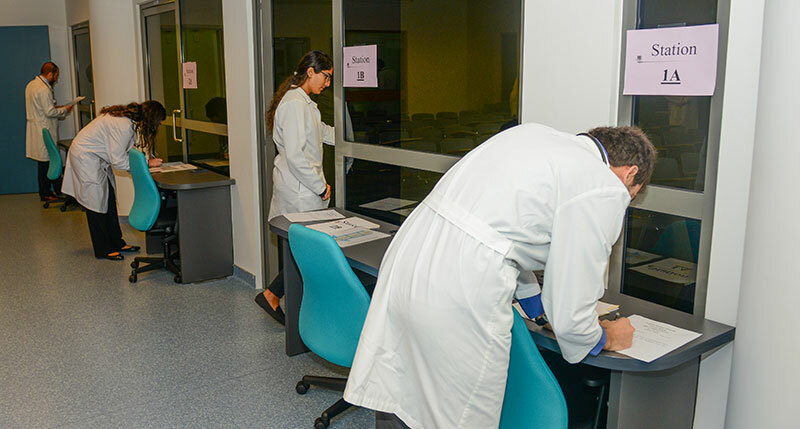 The series of stations may cover aspects of the following: behavioral sciences, human disease, law, ethics and professionalism, clinical dentistry, restorative dentistry, paediatric dentistry, orthodontics, preventive dentistry, dental public health, comprehensive oral care, oral surgery, oral medicine, oral pathology and oral microbiology, dental radiology and imaging. There will be a maximum of 20 stations and the OSCE lasts 2 hours in total. A diagnostic and treatment planning exercise - This involves an actor who will provide an appropriate history (but will not be examined), together with relevant additional information such as photographs, radiographs, study models or results of other special tests. The exercise may involve any of the above aspects of clinical dentistry. If you fail either Part 1 or Part 2 of the exam four times you will not be given the opportunity to sit the exam again. Can a candidate work in the UK as a dentist while waiting to complete the ORE? Yes, you can work, but you must have temporary registration with the GDC. Please be aware that posts available under temporary registration are limited and there is also a very high demand for these posts. Note: A candidate can go on a STANDARD VISITOR VISA to write the ORE exam. candidate should pass with in 5 Attempts/5 Years whichever comes first. IELTS: Overall 7, no less than 6.5 in each. Along with above all two steps will be added. To be eligible to practice in Canada. IELTS Academic: Overall 7 with no band less than 7. PTE: 65 overall, with not less than 65 in each section. TOEFL iBT – 94 minimum and 24 in L & R, 27 in W, 23 in S.
Will be conducted only 2 times in year. Can attend N Number of times. VIHA is the only company from India that is accepted into the NHS International Employers list under Code of Practices. VIHA is the only company which does Recruitment* for free. VIHA gives 100% genuine & transparent information. VIHA is the only company that gives Spouse Job Assistance to the primary enrolled candidate (if applicable). VIHA is the only company giving training for ORE / LDS in India. The Health and Care Professions Council (HCPC, formerly the Health Professions Council, HPC) is a Statutory Regulator of over 344,000 professionals from 16 health and care professions in the United Kingdom. Some of the Professions are - Physiotherapy, Biomedical, Dietician, Psychology, Radiography, Paramedic, Chiropodist etc..
Each profession at the HCPC has its own specific criteria for assessment, which are set out in the profession specific elements of the standards of proficiency. The overarching framework applies to all professions and an applicant must satisfy the Registration Assessor in their application how they meet the benchmark Standards of proficiency. This can be demonstrated through a combination of education, training and experience gained in practise of the profession for which they are seeking registration. Applicants are strongly advised to give as much detail in their application as possible and get their university/college to complete the course information form. HCPC does not comment on the ability of an applicant to practice in their country of training, however, some courses are broader with less in depth coverage, and others are more detailed but have a narrower scope. Significant experience may make up for shortfalls in training. HCPC assessors make their determinations based on all of the information that you provide. Please remember to provide as much relevant detail as possible. The ability to communicate effectively in English is critical to working effectively as a health professional in the UK. Consequently, we can ask you for information about your ability to use English. If you are making an application to become registered as a Speech and Language Therapist the language testing exemption does not apply (please see the table below). Applicants whose first language is not English and who are required to provide a language test certificate as evidence of their proficiency must ensure that it is, or is comparable to, IELTS level 7.0 with no element below 6.5 (or IELTS level 8.0 with no element below 7.5 for Speech and language therapists). If you propose to rely upon a non-IELTS test score that is not listed below, it will be your responsibility to provide evidence that it is comparable to the requisite IELTS levels. Failure to do so will delay the processing of your application. IELTS or other English language tests which are equivalent to IELTS level 7 (no element below 6.5) may be submitted. If you are submitting any other acceptable test that is not IELTS, you must prove the equivalence of that test. The standard required for speech and language therapists is level 8 (no element below 7.5). All test certificates must be dated within two years of the date we receive your application. higher standard applies to all applicants (except those who have completed an approved speech and language therapy programme in the UK). ** Cannot accept any TOEFL test score undertaken in the United Kingdom. • do not hold an approved New Zealand / Australasian postgraduate qualification. Under New Zealand law (HPCAA 2003); a doctor can only be registered in a vocational scope if they meet all three of the following requirements: hold the “prescribed qualification; is fit for registration; is competent; to practise in the relevant vocational scope of practice. Council does not have a list of approved overseas postgraduate medical qualifications for vocational registration. Instead, a case by case assessment is undertaken of your qualifications, training and experience compared to those of a New Zealand trained vocationally registered doctor in the same area of medicine, holding the New Zealand or Australasian Fellowship, Diploma or Certificate. This assessment is conducted by the specialist medical college who provide advice to Council. Council makes the final decision on any applications. All IMGs are required to work in a provisional vocational scope of practice before vocational registration can be granted. Council determines the requirements the IMG needs to complete to obtain vocational registration, which includes supervised practice (with reporting) and / or types of assessments. Provisional vocational scope registration is granted to allow the IMG to complete set supervision and / or assessment requirements within 18 months of being registered in a provisional vocational scope. The minimum period required on a provisional vocational scope is 12 months of satisfactory supervised practice. This allows an IMG’s competence to be confirmed, and for the IMG to be inducted to their new place of employment, and orientated to the New Zealand health system. has VEAB advice indicating that his or her qualifications, training and experience is “equivalent to” the NZ or Australasian prescribed qualification. This doctor will usually be required to complete 6 months of satisfactory supervised practice (refer para 15 below). Council will take particular note of any recommendation (with specific reasons) from a VEAB that an IMG should instead complete 12 months under supervision. The IMG will be able to achieve registration in a vocational scope of practice within 18 months of obtaining registration in a provisional vocational scope. The Faculty of Dental Surgery (FDS) of the Royal College of Surgeons of England is able to sponsor suitably qualified postgraduate dentists to come to the UK for clinical training in an approved hospital training post. The PLAB test is becoming more rigorous and more reflective of real-life practice. The new version of the Professional and Linguistic Assessments Board (PLAB) test starts from September 2016. To apply for one final attempt (4th time), you will need to demonstrate evidence of additional learning over a 12 month period and make an application to the GMC. To apply for one final attempt (4th time), you will need to demonstrate evidence of additional learning over a 12 month period, and make an application to the GMC. If successful with this application, you will have to sit part 1 again first before taking part 2 one more time. When and where can I take PLAB? We (GMC) run the exam four times a year in the UK and twice a year at a number of centres overseas. Examinations in the UK close one week before the exam date. Those overseas close four weeks before the exam date. You can only take Part 2 at our Clinical Assessment Centre in Manchester, UK. Examinations close about five weeks before the exam date. The number of places in our Part 2 examination is not linked to the number of jobs available. The Examination shall consist of 200 questions to be answered in 3 hours. The Examination shall be held under invigilated conditions and candidates shall not be permitted to take into the Examination, or refer to, any books, notes, materials or other aids, including electronic devices. The candidate shall be awarded one mark for each question answered correctly. The Examination shall be graded pass or fail. A candidate may have unlimited attempts at the Examination, subject to them holding an acceptable primary medical qualification and being able to satisfy the GMC’s requirements as to their evidence of proficiency in English. No candidate who has previously sat and passed the Examination will be allowed to resit it unless directed to do so by the GMC or they have not passed Part 2 within three years of passing Part 1. This period will be reduced to two years from 1 September 2017. You’ll get your results about four weeks after you take Part 1 and two to four weeks after you take Part 2. You’ll receive an email with a link to the My Tests section of GMC Online where you’ll find your results. Results can’t be given by telephone, fax or at our reception. The pass mark and the average mark achieved by all candidates at the exam you attended. Your mark and the examiner comments for each station. MTI(p) scheme enables non-UK/EEA pediatricians, with MRCPCH or other postgraduate qualifications, to undertake high quality postgraduate training in pediatrics for a maximum of 24 months, before returning to work in their home countries. 1. International Fellows on the MTI(p) scheme work in an RCPCH-approved clinical setting, exposing them not only to the specified area of pediatrics but also to child protection, safe prescribing and medico-legal practice. 2. We encourage Fellows to engage in reflective practice and coaching/mentoring. 3. The scheme provides Fellows with the opportunity to enhance and develop skills across a range of areas including leadership and management, developing guidelines, conducting audit and research and understanding of clinical governance. The focus is to work in an environment with a patient-centered approach. 4. The College is committed to providing a training opportunity that benefits the Fellow, their home country and the NHS units in which they will be working. 2 routes to get a MTI position. 1. Be resident overseas at the time of application to the scheme and have no rights of residence in the UK/EU/EEA/Switzerland. 2. Hold a primary medical qualification recognized by the General Medical Council (must appear on the Avicenna Directory). 3. Have completed an acceptable internship (or equivalent) of not less than twelve months following undergraduate training (in accordance with the General Medical Council requirements). 4. Hold an appropriate postgraduate paediatric qualification (preferably gained within the last 3 years) OR full MRCPCH. 5. Have been engaged in medical practice for a minimum of 36 out of the last 60 months including the most recent 12 months. 6. Hold a record of satisfactory training of at least 36 months’ clinical training in paediatrics (including general paediatrics, neonatology, paediatric sub-specialties and no more than 6 months of a non-paediatric speciality during this 36-month period). 7.5 overall and at least 7.0 in each section (speaking, reading, writing and listening). The test is valid for 2 years from the date it was taken. No other English language examination will be accepted nor exceptions be granted. Candidates must hold a valid IELTS certificate at the point of application and any subsequent registration with the GMC. In the 2017 round, we will not accept any applicant without a valid IELTS score. to make separate applications, and if successful, will be granted separate visas. Reference reports are not used during the interview but will be reviewed during the selection process and again prior to confirmation of appointment for successful applicants. The reference process is designed to check the accuracy of your previous employment and training history and to provide assurance of your qualifications, integrity and track record. We will require your referees to provide electronic and hard copies of the reference forms. On the application form you will be asked a series of questions to assess your fitness to practice. The MTI(p) Trust route is for those applicants who have themselves secured a suitable placement within an NHS Trust in the UK (ie the placement has not been advertised and appointed to via the College scheme). The application process works in a very similar way to the MTI(p) College route; however, the NHS Trust is responsible for managing the selection process. An application can be made via the MTI(p) Trust route at any time throughout the year. The Royal College of Anaesthetists (RCoA) has rebranded the Overseas Doctors Training Scheme (ODTS) to reflect its International Programme. The spirit and intention of the International Programme is to foster and develop links with overseas organisations. Under the umbrella of the International Programme is Medical Training Initiative (MTI). 1. GMC registration (please note that offers of sponsorship as a route to GMC registration are based upon the GMC's decision and approval and are only valid once this has been granted). 2. Facilitating Tier 5 visa application. 3. Eligibility to sit the FRCA examinations. If the applicant requires PLAB exemption along with examination eligibility under MTI, the current administrative fee is £ 645. An initial fee of £135 is to be submitted with the application. This is non-refundable. The balance of £ 510 must be paid after MTI sponsorship is granted and before the RCoA can issue a ‘Certificate of Sponsorship’ to the GMC for PLAB exemption. If the IMG only requires examination eligibility and already has obtained GMC registration, the current administrative fee is £135, which must be submitted with the application and is non - refundable. The fee also covers one year’s subscription fee for registration with the College. The Royal College of Pathologists (RCPath) will act as the ‘professional sponsor’ through the Academy of Medical Royal Colleges (AoMRC) who is the overarching visa sponsor and is responsible for issuing the Tier 5 Certificate of Sponsorship (CoS), which enables an applicant to apply for their Tier 5 visa. 1. The MTI(Path) College route is for those who haven’t been offered a placement but would like to undertake clinical training in the NHS for a maximum of 24 months before returning to their home country. 2. The MTI(Path) Trust route is for those applicants who have themselves secured a suitable placement within an NHS Trust in the UK. Perinatal Pathology, Medical Microbiology, Medical Virology, Hematology. The Medical Training Initiative (MTI) is designed to enable a small number of International Medical and Dental Graduates to enter the UK to experience training in the NHS for up to two years before returning to their home country. The paid posts are approved by Deaneries/LETB and the Academy of Medical Royal Colleges acts as the UK Sponsor to enable participants to apply for a Tier 5 visa with the UK Borders Agency. On receipt of a complete application from a doctor by midnight of 29th January 2017, the RCPsych will send an acknowledgement. The application will then be processed and all those candidates that meet the requirements will be invited to a video interview at a predetermined date in either February or March. Successful candidates will be granted the opportunity of sponsorship by the RCPsych to register with the GMC and to apply for a Tier 5 working visa valid for up to 24 months, dependent on agreement of a core training post with a Trust. 1. Must hold a primary medical qualification recognized by the UK General Medical Council (GMC). 2. Have completed an acceptable internship (or equivalent) of not less than 12 months following undergraduate training. 3. Have at least three years’ experience working in Psychiatry in the last five years, including the last 12 months. 4. Have achieved a minimum overall score of 7.5 in the International English Language Testing System (IELTS) Academic Test within the last 18 months, and at least 7.0 in each category. 5. Have been engaged in at least 2 years of full-time clinical practice, including the last 12 months. 6. Be resident overseas at time of application and have no rights of residence in the UK/EU/EEA/Switzerland. 7. Obtained, or are working towards, a postgraduate qualification in psychiatry. 8. Have not previously made any unsuccessful attempts to register with the GMC (e.g. PLAB test) within the previous 12 months up to the point of the application deadline (29/01/17). Have also not exceeded the GMC’s limit on unsuccessful attempts at the PLAB test. MTI International Fellows are required to pay RCPsych an administrative fee of £200-£500. This is per the fee banding of their country of residence (for fee bands, please see here). The Royal College of Emergency Medicine is one of the Medical Royal Colleges taking part in the Medical Training Initiative (MTI). The MTI is a government authorized exchange under Tier 5 of the Points Based System allowing overseas trainees to obtain training in the UK for up to two years. Successful applicants can obtain full GMC registration without taking the Professional and Linguistic Assessment Board (PLAB) test. The Royal College of Emergency Medicine matches successful applicants to training posts. 1. Not (normally) hold EEA citizenship or EEA rights of residency. 2. Hold a Primary Medical Qualification acceptable to the GMC for full registration. 3. You will be asked to provide details of your registration and licensing for all the medical regulatory authorities of any countries where you have practiced or have held registration or a license in the last five years. You will need to provide Certificates of Good Standing (CGS) from any country you have practiced or been registered or licensed with since you were granted provisional registration. To read more about this please visit the GMC's registration and application webpages. 4. Have been in continuous medical practice for the most recent twelve months leading up to your application. 5. Have completed at least three years postgraduate training including an internship. 6. Have an institutional sponsor in their home country specifying the post they will return to. 7. Provide evidence of satisfactory progression through training. Acceptable evidence would be documentation of passing any required postgraduate exam, a logbook or training portfolio (if applicable), evidence of clinical governance activity, appraisal documentation. Evidence should cover both generic Emergency Medicine and acute specialties. Any evidence should be validated by the overseas sponsor. 8. Be certified in at least one life support course - ATLS, APLS or ALS (or RCEM recognized equivalent). 9. Have achieved a minimum score of 7.0 in each section (speaking, listening, reading and writing) of the academic module of the IELTS (International English Language Testing System) and an overall minimum score of 7.5. You must be able to provide a test report form that reflects that this test was taken within the last 2 years. 10. Provide contact details of two referees. If you are a trainee these should be your current educational supervisor and one other Emergency Medicine specialist currently or recently involved in your training. If you have already completed your specialty training you should get two references from doctors currently supervising, you. Your referees will be contacted directly by the Royal College. NOTE: Once your application has been approved by the Royal College you will need to complete the application for registration on the GMC website and read the GMC guidance on what evidence should be provided to support the application. You will need to produce original documentation to the GMC on arrival in the UK to confirm your registration. The fee for the administration of an individual application is £215 or £115 for applicants based in lower and lower middle income economies (as defined by the World Bank). You will be charged the fee when your application has been accepted. INDIA – LOWER MIDDLE INCOME: So, we need to pay £ 115 Please note that the GMC's Registration application fee (£ 200 -425) is a separate fee and is payable to the GMC directly on submitting your application. Once your application has been approved by the Royal College you will need to complete an online application for registration on the GMC website. It is a legal requirement that doctors must have their names entered on the General Medical Council's (GMC's) Specialist Register before taking up substantive, honorary or fixed term NHS consultant posts in the UK. Most doctors achieve this by completing a UK training programme resulting in the award of a Certificate of Completion of Training (CCT*, formerly known as CCST). However, doctors who have completed specialist training overseas or via a non-CCT pathway may be eligible for entry to the Specialist Register without undergoing further training in the UK. These doctors may be able to apply for an assessment to determine their eligibility for Specialist Registration. This is known as the Certificate of Eligibility for Specialist Registration or CESR. Under the CESR pathway, surgeons may apply for evaluation of their specialist training or specialist qualifications as well as acquired specialist medical exprience or knowledge wherever obtained, to detrmine if they are equivalent to a surgeon who has completed a UK CCT (or CCST or a CESR (CP)). All doctors practising in the UK must be registered with the General Medical Council (GMC). The usual route to registration for International Medical Graduates (IMGs) is success in the GMC’s PLAB test. Overseas clinical oncologists (radiation oncologists) or clinical oncology (radiation oncology) trainees who wish to undertake a period of specialist training in the UK may be sponsored for registration by the RCR, as an alternative to taking the PLAB test, under the International Sponsorship Scheme (ISS). Sponsorship encompasses both GMC registration and an application for a government authorised exchange visa under Tier 5 of the Points Based System Tier 5 Overview. For those who already have GMC registration, sponsorship for the Tier 5 visa only for the purposes of the ISS may be available upon submission of the forms and information. Potential applicants and employers should note that sponsorship is exceptional and that the PLAB test remains the usual route through which IMGs may obtain GMC registration. The overseas applicant must have been offered a post in the UK before the sponsorship process starts. The ISS operates as part of the Medical Training Initiative (MTI) which is designed to enable a small number of IMGs to enter the UK and undertake training for up to two years, before returning to their home country. Sponsorship for longer than two years is not available. The scheme makes use of spare training capacity within the NHS. Posts offered under this scheme must be approved by the Local Education and Training Board (LETB)/deanery as neither disadvantaging UK or EEA trainees nor adversely affecting existing trainees, and must contain a sufficient training and educational content to benefit the overseas applicant. From 1 October 2015, the AMC will verify qualifications through the Educational Commission for Foreign Medical Graduates (ECFMG) Electronic Portfolio of International Credentials (EPIC), or for applications submitted before 30 September 2015, through ECFMG International Credentials Services (EICS). * Note: We don't charge for Health Care Recruitment.